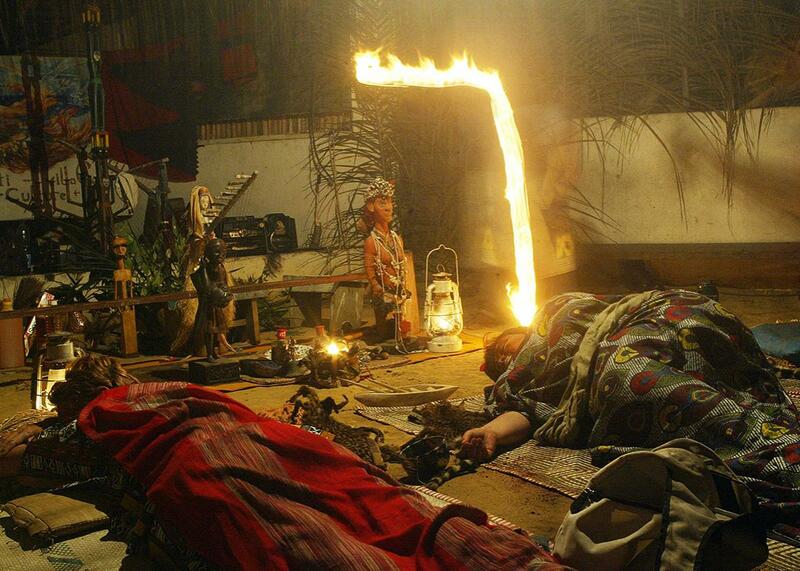 Gabon tourists want to try one of the world’s strongest psychedelic drugs. European women rest in a temple, after taking iboga during an initiation to the Bwiti rite on Sept. 1, 2005, in Libreville, Gabon. LIBREVILLE, Gabon—Jose Saenz was lying on the floor wrapped in a blanket, shaking uncontrollably. The 42-year-old just ingested 30 spoonfuls of wood chips that contain one of the world’s strongest psychedelic drugs, iboga. As the objects around him started to morph into abstract forms, a loud drum circle surrounded him. The music slowly got quieter and quieter until it was just a whisper. Faraway sounds were as loud as screams. Then come the lucid dreams and the hallucinations. After 10 hours of this, Saenz got what he traveled all the way to Gabon for: a vision. Later, Saenz recovered from his psychedelic voyage over a homemade dinner of steamed greens and cassava. He ate slowly and seemed a bit gone still. We were in a living room that looked like a mix of a youth hostel and an ethnologic museum. The space consisted of a long dinner table and several shelves covered in piles of dusty books and memorabilia from all over the world. Better-known drugs like peyote and ayahuasca each contain one powerful brain-altering substance—mescaline and dimethyltryptamine, respectively—but iboga contains at least 12. Locals in Gabon have been consuming it for centuries. But outside of the small Central African nation, not many people have heard of the drug. Iboga was once the preserve of the tribes who discovered it, and the religion that emerged around it in Gabon’s heavily forested northwest. But more research into the drug’s effects has drawn new devotees: foreign enthusiasts and drug tourists. This new popularity has traditional iboga practitioners concerned that their religion is being commercialized and that tourists are unaware of the drug’s sometimes deadly side effects. The iboga plant, Tabernanthe iboga, has glossy green leaves and produces small, oval fruit. Its psychedelic power is buried underground, in its roots. “It’s the earth that gives the plant its properties,” said Paul Akouma, an herbal doctor who learned the secrets of iboga from living with a Pygmy tribe for months in the densely forested northwest of the country and now runs a plant-based clinic in the capital Libreville. We met in his apothecary, a dusty room in a small compound behind Libreville’s arboretum. Akouma, short and stocky, was standing in a maze of tables and counters. On one, he had a small stove and a tin pot brewing with a dark concoction of tree bark. Akouma said it was a remedy for stomach problems. Another table was covered in patient files inside big brown envelopes­—referrals from the hospital, he said. A third surface held all his pre-made medicine—big plastic bottles with self-printed labels promising to cure everything from kidney stones to menstrual pain. I bought a bottle of the latter for $10, it tasted pretty disgusting but really helped. To prepare iboga, Akouma pulls the roots, which look like ginger, out of the soil. He peels off and dries out the bar. In the end, he’s left with a small pile of chips that resemble instant coffee. Akouma says that in small amounts—one to two spoons—iboga stimulates the senses, much like a few shots of espresso. It is often taken to fight muscle exhaustion during long hunting expeditions or canoeing trips. Medium-size doses are used during healing rituals to cure everything from back pain to fever. Not much is known about where exactly iboga was discovered beside the fact that it was found in the forests of Gabon. Over the years, a religion evolved around it—the Bwiti. Iboga is ingested in large amounts—what’s called a flood dose—in initiation ceremonies. This is after two weeks of rituals including long walks in the forest gathering bark for potions and confessional sessions in smoke-filled tents. Finally, on the initiation night, the person who is about to be initiated is invited into the temple, a long rectangular hut flanked with wooden benches and presided by an altar. They are then covered in white powdery clay and asked to swallow the bitter iboga chips. They are surrounded by people who have already been initiated, who look after them, singing and dancing around a fire until well after sunrise. During the 19th century, the Bwiti religion spread around the country. It even reached parts of neighboring Equatorial Guinea and Cameroon. The tradition then split into two forms, one focused on therapeutic uses of iboga and another, more popular one, focused on the spirituality. From the 1920s believers began adopting elements of Catholicism in order to survive the persecution from missionaries aided by the French colonial government. Today, Gabon is still a deeply Catholic nation. Even in the country’s most remote villages, one can always find a makeshift chapel with a cross painted over the entrance. For decades, priests have been taking to their pulpits every Sunday to warn against traditional beliefs like Bwiti and drugs like iboga. Ibogaine, the active ingredient in iboga, was first synthesized in 1901, and was subsequently used in France to treat depression. But its true medical promise was discovered accidentally in 1962, when a heroin addict named Howard Lotsof in New York took iboga and found that when the hallucinations stopped, his craving for heroin had vanished. Lotsof dedicated his life to promoting ibogaine as a treatment for addiction. A study from the early 1990s, Stanley Glick, a neuroscientist in the U.S., found that rats addicted to cocaine drastically lowered their drug intake after consuming Ibogaine. Glick’s work also found this particular alkaloid blocks the receptors of addiction in the brain. Since then, ibogaine rehab clinics have begun to pop up wherever the drug is legal, from Costa Rica to Canada. Many Bwiti practitioners say drug tourism trivializes their religion and the risks associated with taking iboga. Nsa Mve Rose is an obstetrician who also happens to be one of Gabon’s best-known iboga sorcerers. We met in her home, a beautiful, wooden house built behind her clinic in Libreville, which specializes in fertility issues and provides in vitro fertilization. In the kitchen there was a large photo of her dressed in all red during a traditional Bwiti ritual. Beside the sofa was a big wooden panther; above that, hung a leopard skin. In her garden, Rose grows several iboga plants. The plants, and the Bwiti rituals, she said, were too dangerous to commodify. “It sounded scary, but I decided to try it anyway,” said Hugues Poitevin, who first heard about iboga in 1979. Poitevin was probably the first foreigner to lead iboga initiations. We met in his caravan, which looked like it once belonged to a circus ringmaster. Outside, he had a small porch with a couple chairs, several traditional instruments, an empty birdcage, and a worn-out Tibetan flag. Inside was dark and musky. We spoke for a long while sitting on his sofa among hanging amulets and towers of books.